The historical record is full of such stories: He moved to Los Angeles “for health reasons.” She relocated to Southern California “for her health.” Booster rhymes of the late 19th and early 20th century tripped off the tongue: come to Los Angeles for health and for wealth. And come they did, especially following the arrival of the railroads in the 1870s and 1880s, amidst the pathos of collective coughing, and spitting, and shortness of breath. Tuberculars, thousands of them, but others, too, with all manner of pulmonary or respiratory trouble, with swelling of this or that organ, with illnesses known and unknown, all presumably hoping to find cures in the sunshine or at least die warm in the attempt to get better. It’s an old story of expectation atop excitement atop, in many cases, poignant disappointment. Some did get better, sure. But so much depended on what ailed them in the first place. In the age before antibiotics, tuberculosis wasn’t going to be cured by aridity, sunshine, the milk cure, or radical surgery. Unless the bacillus spontaneously went dormant in the bodies carrying it, it wasn’t going to be cured by much. The same is true of so many other often lethal diseases and ailments of the past. The record is full of forlorn truth couched in 19th century terms: this one died of apoplexy; that one lost a battle with dropsy; another fell to consumption. 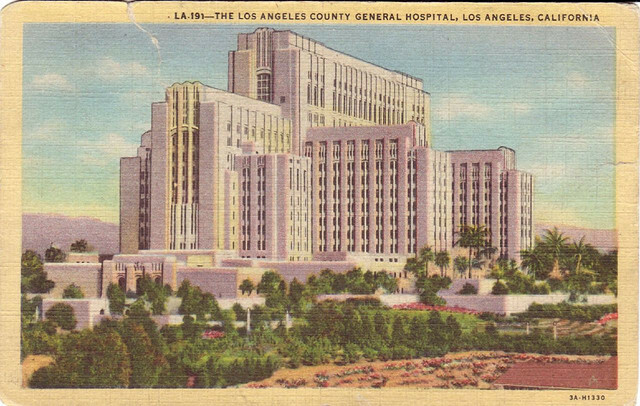 The real estate boom era of pre-Depression Los Angeles was wrapped together with the search for health. These were paired parts of the magnetic draw of the region. Railroad corporations—always at the leading edge of tourist come-ons—knew it, and their ubiquitous and beautiful advertising often had a healthcare feel to it, a way of suggesting sunshine as both antiseptic and vitamin for the ailing and the anxious. Those wounded in war came as well, hoping that healing might result from the migration. Southern California beckoned as a convalescent corner of the post-Civil War world, for Northerner and Southerner alike. Like the soldier who contracted tuberculosis from a tent-hospital blood spatter, or the one made sick by a coughing comrade in the cold and rain of Gettysburg and elsewhere. The one-armed and the one-legged came, too. And they were followed by veterans of the First World War and the Second, of Vietnam, and every war since. Our national consciousness and culture affix Southern California as a place to find fame, celebrity, and self-realization. But this is also a place of hopes pinned on simply finding some relief from this or that health insult or injury. The region’s medical establishment, as well as many of its less conventional and less traditional medical institutions and approaches–owe their initiation and expansion to such fervent wishes. Los Angeles Mayor Eric Garcetti has initiated a fascinating new dimension to that deep history. The mayor recently signed a memo of understanding with the People’s Republic of China that signals a new chapter in the health tourism story of Southern California. Along with such institutions as the Los Angeles Tourism and Convention Board, the Los Angeles Economic Development Corporation, Cedars Sinai Medical Center, City of Hope Hospital, Children’s Hospital Los Angeles, UCLA, USC, and China Southern Airlines, Los Angeles is pledging support of the promotion of medical travel for Chinese patients in need of medical care and surgical procedures to Los Angeles. The many partners in the venture will work together to facilitate the identification, evaluation, diagnosis, transfer, and treatment of patients from China. This is intriguing on so many levels. It acknowledges Southern California’s growing interest in bridging the Pacific and Pacific Rim. It adds a new line to the long story of health-seeking in the Southland. It’s in some ways a redemptive gesture against a long history of terrible treatment of the Chinese in this place, treatment which reached its awful apex in the 1871 Chinese massacre near the Los Angeles Plaza. Not all who come here will be healed. But this kind of partnership to bring people to L.A. to improve their health is historical, historic, and humane all at once. William Deverell, chair of the history department at USC, is director of the Huntington-USC Institute on California and the West.